By Gina Ziervogel and Chandapiwa Molefe, with input from Tali Hoffman, Nick Reay, Daniel Morchain, Maitseo Bolaane, and Kulthoum Omari. 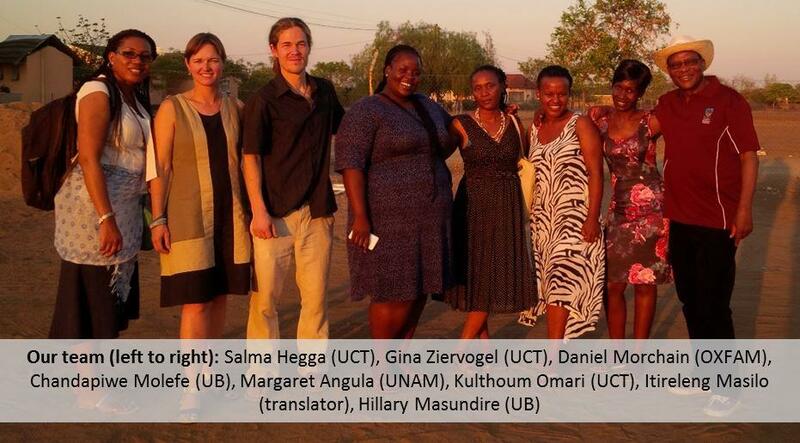 On the morning of the 11th of November 2015, seven members of ASSAR’s Southern African team – from the University of Botswana, University of Namibia and University of Cape Town – met up with Daniel Morchain from OXFAM (himself a member of ASSAR’s cross-regional team) in Gaborone and piled into a minibus to make the 6+ hour drive to Bobonong for the Vulnerability and Risk Assessment (VRA) workshop. Located near the border of Zimbabwe and northern South Africa we encountered temperatures of above 40 degrees; this hot air stayed with us most days and at one point a team member commented that ‘This is fire, not sun’. Our workshop was attended by government officials including one district planner, Village Development Committee members, local community members, representatives from farmer committees, women (market) traders, mopane worm harvesters, basket makers, and homebased caregivers. We referred to this diverse collection of people as our ‘Knowledge Group’. Together we used a VRA approach (developed by OXFAM) to better understand how different people in the Bobirwa Sub District perceive hazards and issues in their landscape. 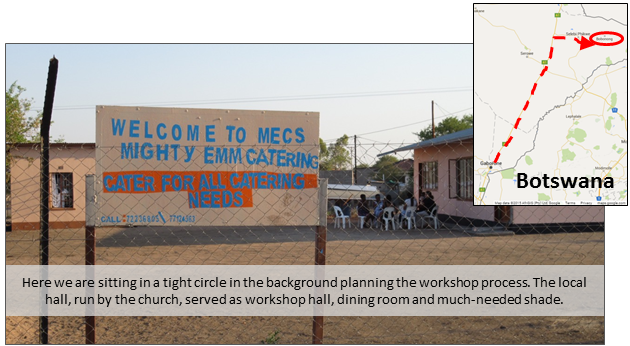 We spent our first day planning the two-day workshop, paying particular attention to the key hazards and issues that had emerged during our previous three research trips to the area, and which would be the focus of our analysis. We began with a list of 15 issues that we reduced to 10 with the guidance and validation of the Knowledge Group. The main hazards identified are listed below. 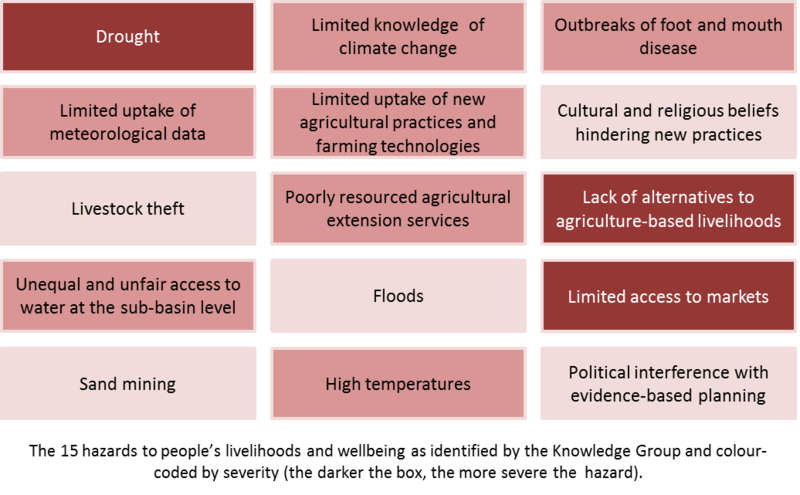 We scored each hazard (between 1 and 4) in terms of (1) how much exposure or potential impact it could have on the specific livelihood group in future and (2) the impact it has already had in the last 15 years. Although the numbers were useful in compiling a vulnerability impact matrix, it was the discussion around these impacts that was most interesting. It took us a long time to get consensus on the scoring because of the rich discussion and different points of view shared. So we split up into three groups to complete the table. Even then this took us took the rest of the day to complete! But we eventually arrived at an impact matrix where the highest vulnerabilities emerged. This led us to our next big task which we tackled on Day 2: understanding the three most important hazards: drought (which we merged with low rainfall and ponds drying up), the limited access to markets and the lack of alternatives to agricultural based livelihoods. On Day 2 we again split into groups to begin to do Impact Chain Analyses. For this exercise, each group looked at one of the three most important hazards and mapped out how that hazard impacts on the livelihoods of the different social groups identified. Drought had immediate impacts on industry, livestock, crop production, mopane worm harvesting, wildlife and tourism. The difficulties in accessing markets impacted small traders immediately, but the impacts then trickled down to family level, where problems arose because of lack of cash flow in the household. The lack of alternatives to agriculture-based livelihoods had several implications including: driving the migration of school-leaving youth from rural to urban areas (such as Bobirwa) where they find no promising livelihood opportunities; reducing potential incomes for small scale farmers (e.g. smaller and less dynamic local markets as well as fewer options for livelihood diversification and risk reduction); and perpetuating the dependence of a considerable portion of the population on social welfare programmes. We unpacked all of these impact chains in greater detail. 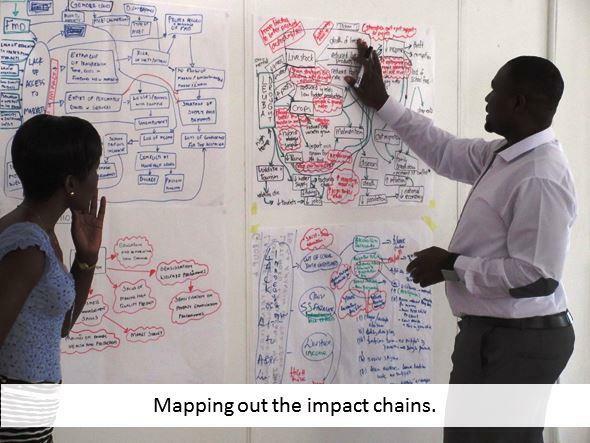 Once the impact chains were mapped we asked the groups to think about the solutions that could address the challenges at different points in the chain, and we discussed each one in depth. For example, we discussed whether the provision of technology to improve agricultural production and the strengthening of traditional adaptation strategies could help people cope with drought. Questions like ‘what resources and institutions are currently available?’, what innovation might be needed for this solution to work?’, and ‘where can existing responses be built on?’ were crucial for our thinking about the feasibility of proposed solutions. We concluded this exercise with a final step of identifying people and organisations that could be the starting points for our solution explorations. Despite the heat the workshop ended on a high with both the facilitators and Knowledge Group exhausted but excited by the sense of possibility and the relationships that had been built. 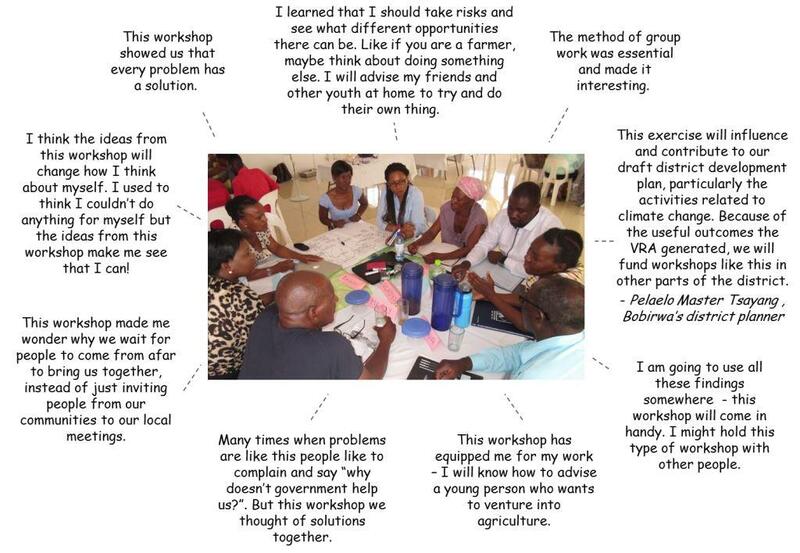 The VRA approach was well-received and proved to all that it was not only a technique useful for yielding research findings but a process that empowers communities with the confidence to address their problems directly. 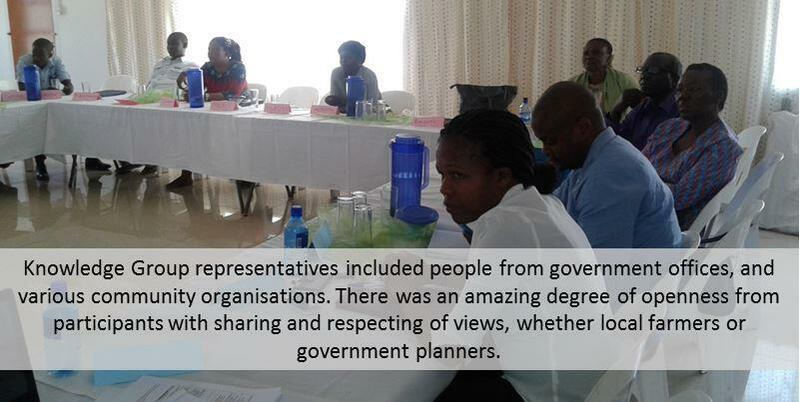 Indeed the VRA workshop has initiated and fostered ASSAR’s stakeholder engagement at the sub-district level. As a next step the UB team will be working with the District Commissioners Office to plan for future VRA workshops with other key stakeholders.